The Reverend Dr John Mason Neale is the central figure depicted in the Oxford Movement window on the north wall of St Swithun’s Church. Neale’s Prayer desk is in the Lady Chapel and his crucifix often hangs over the altar. He is buried in the Churchyard, close to Sackville College, the almshouse where he was the Warden from 1846-66. He took up this post as a young clergyman aged 28, with his wife, their little girl and baby boy. They had 3 more daughters and lived at Sackville College for 20 years. Neale died of chest troubles, probably tuberculosis, in 1866, aged only 48. When Neale died, he was buried in St Swithun’s churchyard. Neale also founded the Society of St Margaret, one of the first sisterhoods of nuns to be founded after the Reformation. John Mason Neale is the most famous and controversial Warden of Sackville College. He rescued the College from decline and decay. He cared deeply about the Residents, for instance setting up an Infirmary room upstairs next to the Chapel, where a sick Resident could lie and still hear the services. Neale and his wife arranged to provide a Sunday Dinner for all the Residents in the Dining Hall every week, because some were so poor. John Mason Neale knew many languages, wrote A History of the Eastern Church, commentaries upon the Psalms, stories for his children and he wrote and translated many hymns. The Carol Good King Wenceslas, first published in 1853, was written in his study at Sackville College, looking out across Ashdown Forest. Although from an Evangelical background, John Mason Neale became High Church in taste when at university. At Cambridge he became a founder member of the Cambridge Camden Society. He had friends connected with the Oxford Movement, which sought a revival of ‘the beauty of holiness’ in the Church of England. Low Church people were suspicious of Neale- especially in East Grinstead, with its 3 Protestants Martyrs burnt to death in the reign of Queen Mary Tudor. The High Church style restoration of the Chapel at Sackville College, by Neale’s friend, William Butterfield, included a big cross on the rood screen, and an east window depicting the Virgin Mary and Child in stained glass, and other saints to the right and left. The tone of these changes led to a 13 year quarrel with the Bishop of Chichester at the time. This window dates from 1933, which was the anniversary of the founding of the Oxford Movement. The window was apparently unveiled by Mr Patrick Sutherland-Graeme, Assistant Judge Advocate General and a grandson of Dr Neale, on 17 June 1933, when there was a Procession and Pilgrimage to commemorate this centenary. The central figure is Neale, wearing a green chasuble, a vestment which he wore when officiating in Sackville College Chapel. His daughter, by then Mother Ermenild, the Mother Superior of St Margaret’s Convent, provided a photograph of her father, which was copied faithfully by the artist, Harry Grylls of Burlison & Grylls, Great Ormond Street. Sackville College is shown in the background. Below appear the words ‘Oxford Movement Centenary, 1833-1933’ and above on a scroll supported by angels, the motto of the Convent ‘Per Angusta ad Augusta’ (through difficulties to greatness). The figure in the lower left is John Keble (1792-1866), holding a copy of ‘The Christian Year’, with Keble College Chapel in the background and coats of arms for 3 Oxford Colleges, including Keble College, founded in his memory. Keble was about 20 years older than Neale but they were great friends and died a few weeks apart. In an academic sort of practical joke, Neale once quickly translated a hymn written by Keble into Latin, whilst Keble was out of the room, then showed Keble the supposed ‘original’ of the hymn. Keble was ‘utterly confounded’ until Neale admitted that he had only just created the ‘original’ Latin version. Whilst the humour is a bit hard for us to grasp, the story shows the friendship and keen intellect of the 2 men. Above Keble is Nathaniel Woodard (1811-91), holding the Chapel of Lancing College. From 1848, Canon Woodard founded schools intended to provide a sound education and religious instruction according to the Church of England doctrines. In Sussex there are 3 Woodard schools: Ardingly, Hurstpierpoint and Lancing Colleges. On the top right hand side is Walter Farquhar Hook (1798-1875), who was Dean of Chichester. He is shown holding the spire of Chichester Cathedral, which fell down during his tenure and had to be rebuilt. Below, Hugh James Rose (1795-1838) is shown, holding an issue of The British Magazine. He was one of the theological writers whose Tracts for the Times effectively founded The Oxford Movement. He was born in Sussex, so all the figures have a Sussex connection, except John Keble. In the centre of the lower part of this window there are 8 lozenge shaped panes or quarries of old glass. 3 have the arms of Henry VIII’s son, Edward VI, as Prince of Wales. King Edward VI came to the throne in 1547, so presumably these panes were made before then. Another pane has the arms of the Merchant Taylors’ Company, 2 a merchant’s mark, and 2 the figures of St John the Baptist, who is the Patron Saint of the Merchant Taylors’ Company. People with very keen eyesight may be able to pick out the initials R.H. in the merchants’ marks. These may refer to a Richard Hylles, Master of the Merchant Taylors 1561-62. We do not know why these pieces were inserted into this window and whether they have any connection with East Grinstead, but I think that John Mason Neale, who cared so much about the fabric and fixtures of old churches, would have been intrigued. In 1966, there was a special service in St Swithun’s to commemorate the centenary of Dr Neale’s death. 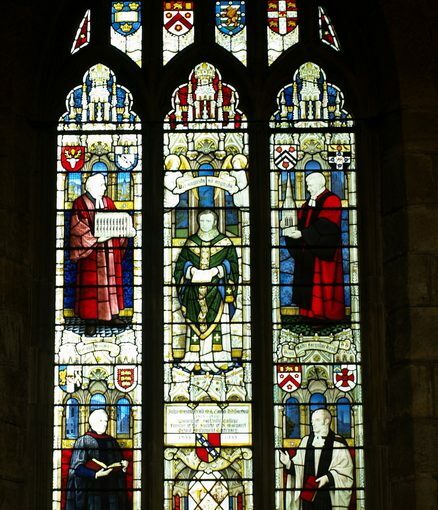 This window with its beautiful portraits of John Mason Neale and like-minded High Churchmen, and the very old Tudor glass, is interesting in many ways and well worth a good look.